The following is my ridiculous way of celebrating Independence Day. This morning, Carrie and I were sort of half-watching the Today Show, and one of those "what do people on the street think?" kind of segments came up. Jenna Wolf was asking random New Yorkers about the holiday and how old the United States is today, and one man said, "Well, the war was over in 1789." It certainly was! The surrender at Yorktown occurred in 1781, and the treaties that formally ended the war were signed in 1783. But what if the war had gone on for a decade and a half or so? I couldn't help imagining the following scenario. Please understand that I'm not casting aspersions on any of the Founding Fathers nor pardoning any of our present or recent enemies by comparison; this is not really a political statement but just a somewhat over-the-top joke. Please enjoy. As the war with the colonists enters its fourteenth year, sources close to General Charles Cornwallis say that the Commander of Colonial Forces' earlier optimism has begun to flag. "He's started to call it a quagmire, an unwinnable war," reports one of the general's closest advisors, speaking on condition of anonymity. Though British troops now hold New York City and much of the territory immediately east of the Hudson River, some dispute the strategic value of these areas. "Who gives a s— about f—ing Manhattan Island?" as one regional commander puts it. On the other hand, Sir Richard Smith, a noted military analyst, argues that New York may be one of the most crucial sites now held by British forces. "With no foothold in Massachusetts and New Jersey—and don't get me started on the southern colonies—New York is as firm a stronghold as we could have hoped for. We're fighting a war with several fronts, and our backs are to the sea. New York may not seem like much, but it's held out for most of the war." Recent talk of pushing northward to eliminate one of the war's fronts, to say nothing of securing the key port of Boston, has met with strong disapproval both among the troops and at home. "Massachusetts seems like an obvious place to push hard now, but soldiers don't want to go there," Smith says. "Stories coming from the north say that Bostonians have been holding trials and burning loyalists at the stake for months now. They must have run out of loyalists some time ago and turned on themselves. It's horrible to think about, but it would hardly be the first time." Meanwhile, Philadelphia, under a cease fire for nearly three years now, continues to present challenges. "It's hard to know how to deal with these Quakers. Their leaders say they want peace and an end to the war, but insurgents attack convoys moving medical supplies and food from New York to Philadelphia every week. Religion of peace my a—," says Colonel David Southampton, who is in charge of the city. Perhaps the greatest challenges have come from the southern colonies, however. 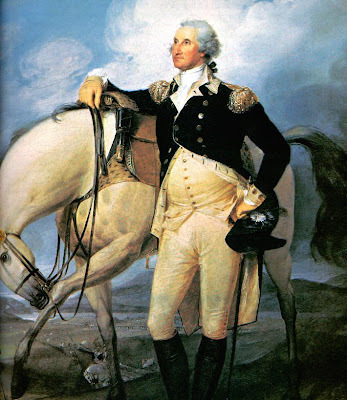 Troops who haven't been incapacitated by disease have to face General George Washington's Continental Army. "They're dug in, and they know what they're doing. They know the land, and we trained these guys, for God's sake," says Lt. Colonel Banastre Tarleton. "But we'll find the CA. Charlie's out there somewhere, concentrated in some swamp in Virginia most likely, thick as hasty pudding, and when we find him, we'll kill him. Then we'll go after the purple-p—ing French and clean out their nest, too"
General Washington, believed by many to be the inevitable successor to the ailing President Benjamin Franklin as head of the recently formed Democratic Republic of America, has been directing operations in the central and southern colonies for several years now. He benefits from the assistance of large numbers of French troops believed to be stationed in Georgia. His tactics have stymied our troops throughout this period, as Washington's forces rarely engage in open combat, preferring nighttime raids and various other ambuscades. Reached for comment, General Cornwallis had this to say: "I just don't know. Maybe we can win the war. After all this time, though, we realize the next challenge will be winning the peace."